For this task, I chose the theme “power”. Power is portrayed in many ways, and can be looked at and displayed as good or bad. The photo I’ve chosen displays “power gone bad”. 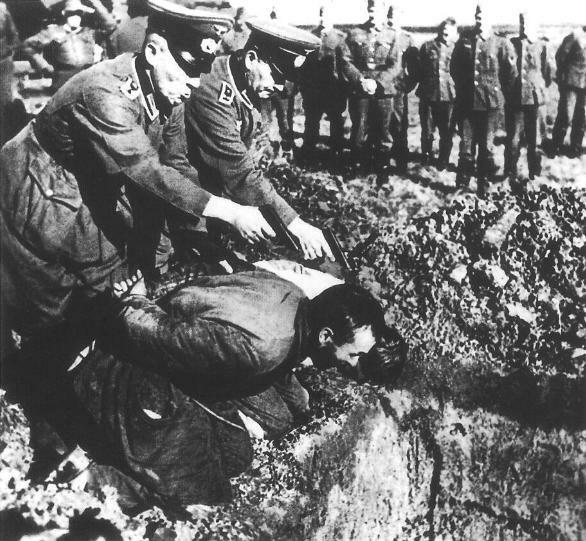 The photo is taken in world war two, and is showing us two Nazi officers pointing guns at two men, facing down towards some sort of trench. Surrounding the officers and their victims, there’s a bunch of Nazi soldiers watching the whole thing. The power lies in the officers hands (the guns) in this instance – as they can chose to kill or not, holding the guns to the back of the victims heads. The Nazis and Hitler had an incredible amount of power that demanded an insane high number of deaths back in this period of time. I assume, that the two victims are Jewish. And I also assume that the two Jews did in fact get killed after this photo was taken. What looks like a trench, might in fact be a mass grave, in which the Jews fell into after being shot. To me, this photo shows the power the Nazis had in World War II – and therefore, it also displays the theme I picked; power. Also, the soldiers are strictly lined up at the back of the photo, which suggest respect towards the officers, which again can be associated with power. The photo is also built up on diagonal and horizontal lines. These lines helps the viewer around the image, and makes you look at the surroundings, and not just the main part (officers, guns and the Jews). The photo is nearly a perfect square, and some sort of mix between a large total, total and half total. The obvious contrast is black an white, but also contains a contrast of fearful and non-fearful. Well, that’s it from me folks. For now anyways. This entry was posted in Learning activities, Week 7 - An Image and it's message. Bookmark the permalink.